Update! We’re very happy to say that Lauren was able to secure a foster through Dogs on Deployment! PACT is always grateful to other organizations who help out pets and military members in need. Thank you to everyone who shared Maya’s story and helped spread the word! Lauren is a member of the US Marines and recently learned that she will be sent on an overseas assignment from 2/3/2019 – 9/15/2019. PACT is looking for a great foster home for her beautiful dog, Maya, near their home in Springfield, VA.
Maya is a 2 year old mixed breed. She is about 50lbs, spayed, and microchipped. Maya is leash and crate trained, and understands commands for sit, stay, leave it, up, down, wait (for meals), come, spot, and eyeballs (at me.) Maya is a smart girl who enjoys the mental stimulation of obedience training, and an energetic love who enjoys walks to the park, playing with her pals at the dog park, and playing with her people in the yard. Maya is a very considerate and quiet dog in the home, but may become a little whiny when you first leave for work in the morning. 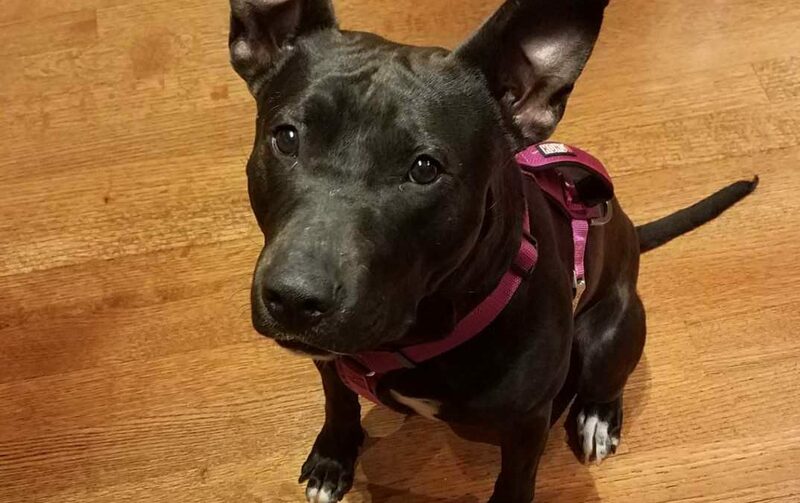 Maya has not had any experience living with young kids or cats and would do best in a home with adults or teens and maybe one other calm dog to hang out with. Could you be Maya’s ideal foster home? If you are interested in fostering wonderful pets like Maya, please fill out a Foster Family Application. If you are interested and have already completed your Foster Application, please email info@pactforanimals.org and let us know!